A Good Protective Case for Your Laptop Charger . Made with Nylon material and sturdy zipper. Well padded semi flexible covers and lining offer excellent protection. The main compartment can be loaded with laptop power supply lead, mouse, charger and etc. 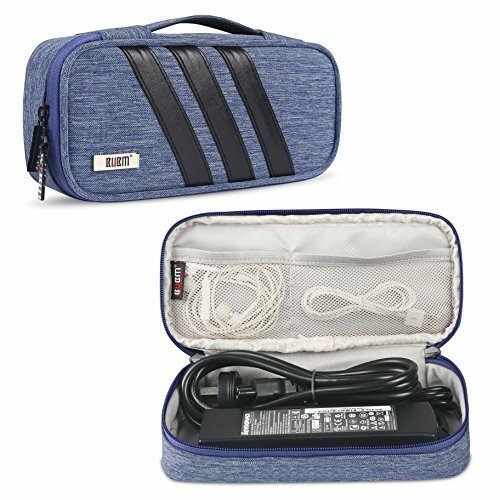 Two mesh pockets for accessories like small cables, USB drives, headphones and etc. Two adjustable padded dividers for changing the internal structure according to your need. Specifically designed for items like AC adapters, laptop chargers. You can also fill it with basic first aid items, makeup, toiletries when you travel. A good choice for you all! Made of easy-to-clean waterproof nylon. More durable and scratch-resistant. The main compartment can hold a laptop power supply lead. Two mesh pockets for accessories. Two adjustable padded dividers for changing the internal structure.